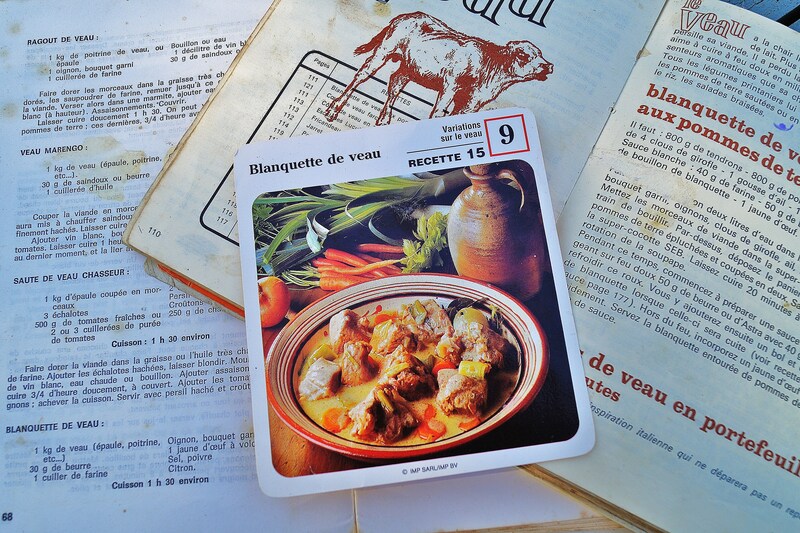 If there is a dish that has been made by at least three generations of women in my family, it has to be Blanquette. Funny name for the proverbial duvet cover of comfort foods methinks, but I think it refers more to the colour that the dish, which in its final stage, rewards the eye with a beautiful white colour and silky texture. 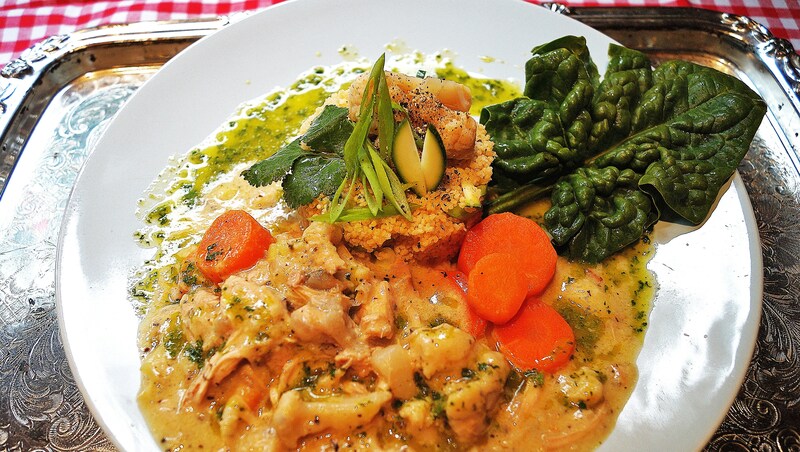 It is traditionally made with veal but the availability in Ireland is next to nil. On another note, I do not care too much for it, partly for ethical and anthropomorphism reasons… Don’t ask. 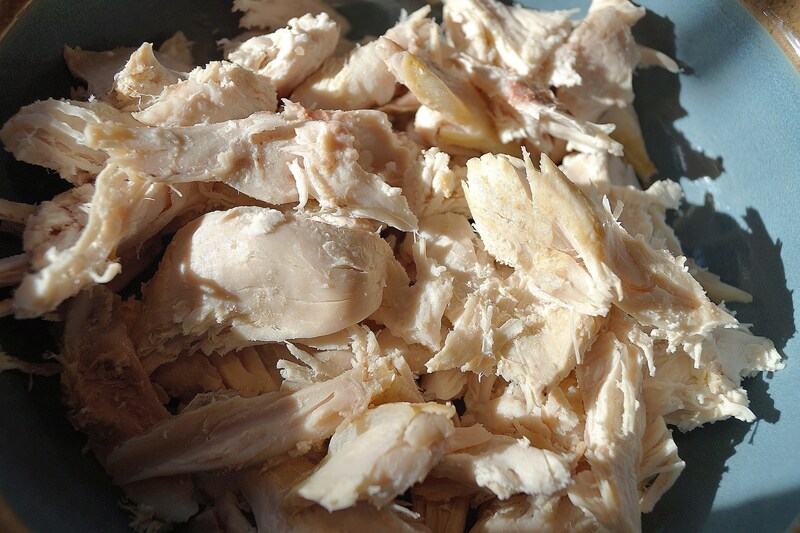 You can use fresh chicken breast and if you follow the strict rule of Blanquette making; it will implicate poaching the pieces in water, removing them and keeping the stock. I had though, a good bit of left over roasted and local organic chicken from the weekend. It normally goes into a homemade curry but I decided to apply the laws of family physics on that one and I am happy to say that I broke the code. The end justifies the means I guess. 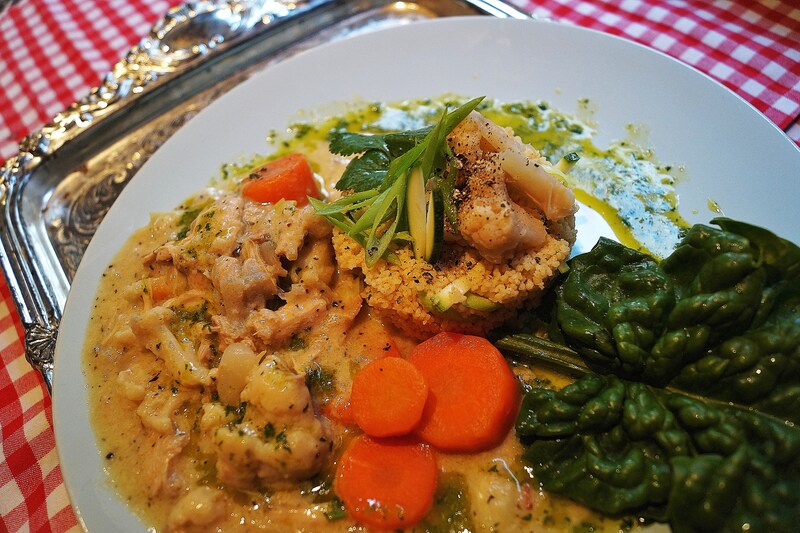 If the normal vegetables accompanying the dish are mostly carrots and onions ( and maybe a bit of celery and a rosemary sprig), I decided to give it a Breton twist with cauliflower and a drizzle of fresh coriander pistou ( coriander, olive oil and a bit of garlic). Apart from that, I followed the rules… Here we go. 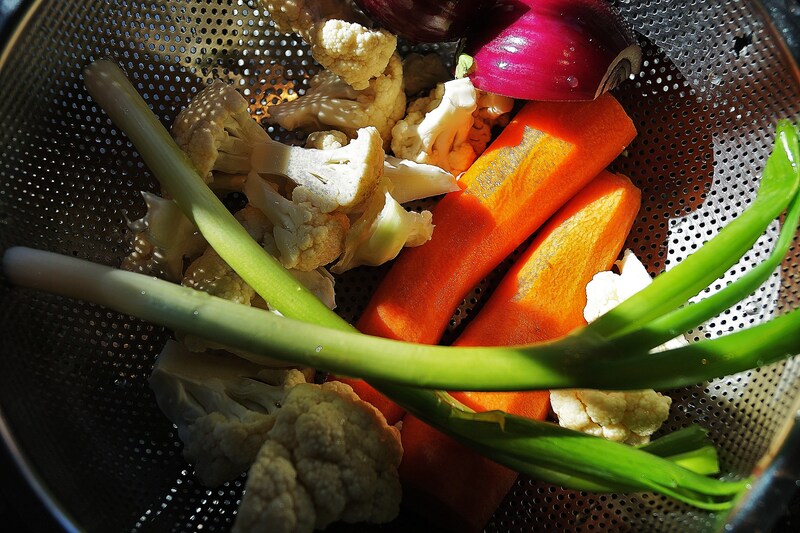 Peel and chop the carrots, portion the cauliflower into small pieces and wash well. Dice the red onion and slice the scallions. Sauté the vegetables together with the garlic cloves chopped in halves; add the salt and pepper and the pieces of roasted chicken. Cover with water to level and let the lot simmer gently for 30 minutes. In a bowl, mix the fresh cream and the egg yolk together; with a ladle, gently add a bit of the cooking juice and mix with a fork. You will pour that mix back into the pot before serving. Leave the pot to simmer gently while you make the pistou. Wash the bunch of coriander, and chop, leaves and stalks. 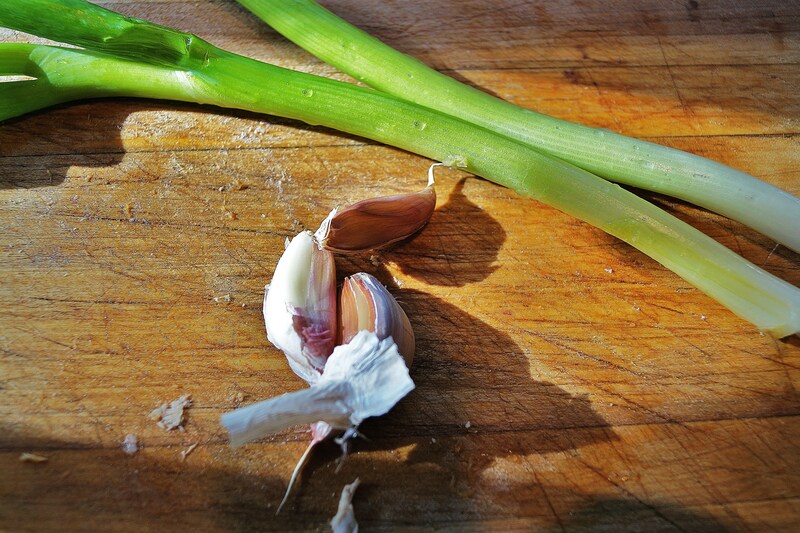 Blend or whiz with olive oil, a pinch of salt and ½ a garlic clove. Pour the creamy bowl back into the pot but make sure it stays under boiling point. Stir and serve with couscous ( very fusion! ), rice or boiled potatoes. I am in not-so-sunny Brighton. We have the sea on our doorstep but it has been very, very grey for what feels like ages now! I can’t wait for some sun and some warmth.